How Nonprofit Organizations can use SMS to mobilize Millions of Volunteers, Dollars, and Supporters. Many consumers are familiar with popular brands using CSCs in their marketing efforts, such as ESPN, Walgreens, Barnes & Noble, J.C. Penney, and Lands End to name a few. 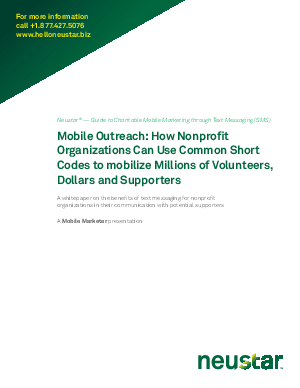 Now, non profits and government entities are using short codes more and more to reach their constituents.